Hollybeary Creations : NND May Release Day 4!! NND May Release Day 4!! Happy Thursday everyone, It's our final reveal day at Newton's Nook and tomorrow the entire release will be available in the shop!!! You didn't think we forgot about Newton, did you? Today we are introducing two new Newton sets... Newton's Donut and Newton Loves Boxes! Each set also has a coordinating die set. 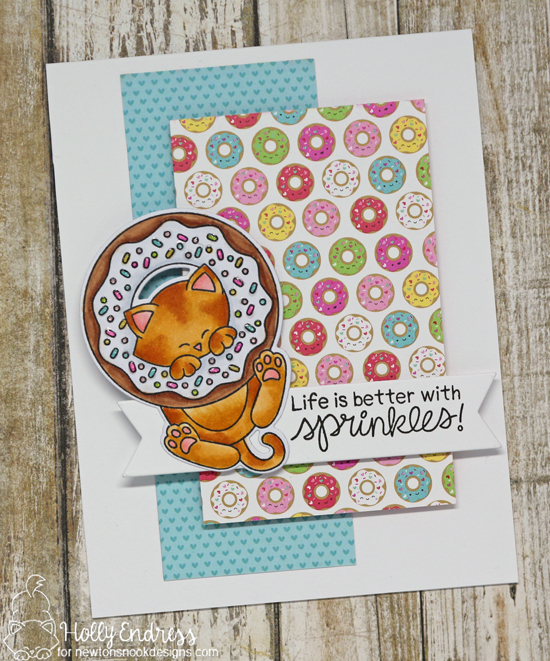 My first card featured Newton's Donut and some Fun pattern papers from Doodlebug Designs. I created an A2 size White card base and then I added some pattern papers. The donut paper layer has some Fun Foam behind it for a little height. Then I die cut a sentiment banner from the Frames and Flags Die set and stamped the sentiment along the Right side. I adhered to the banner with some Foam tape. Using a mix of Fun Foam and Foam Tape gives you different heights in your layers without making your card too bulky. I stamped and colored Newton in with Copic markers and then I used the coordinating dies to cut him out. I added some Clear Nuvo drops over the sprinkles for a little shine. The Newton Loves Boxes set is perfect for any cat owner... What cat doesn't love a good box? I paired the Newton image with some more Pattern Papers from my Stash. I covered an A2 size card base with the wood paper and then I used the new Framework die set to cut the scalloped rectangle piece out. I added some Fun foam and adhered it in the center of the card. I added a strip along the top of some Polka Dot paper and then I die cut a sentiment banner from some more of the coordinating papers using the Frames and Flags die set. I stamped and colored the Newton image with Copic Markers and used the coordinating dies to cut him out. Then I adhered him over the sentiment with some foam tape. I wanted an extra pop of the Green so I added some coordinating enamel dots. 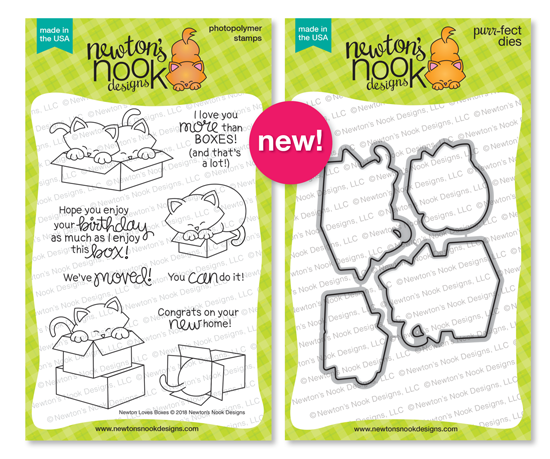 Would you like to win the “Newton's Donut or Newton Loves Boxes” Stamp Set? Comment on the NND blog and Design Team blogs (see list below)! The winner will be chosen at random from the collective reveal posts. Make sure to check out each of their blogs and comment for your chance to win. You will not know which blog has been chosen so the more you comment on the better your chances are of winning! You have until Thursday, May 17th at 9pm EST to comment -- winners will be announced on the blog post on Friday, May 18th. Oh my gosh - So adorable. Love your coloring and the added patterned papers! Great cards! I love your use of patterned paper. Oh my goodness!!! Your cards are stinkin' cute!!! I love both of these fun sets! Sweet cards with pretty coloring! Newton is so adorable! Love your coloring and love how you used that patterned paper! 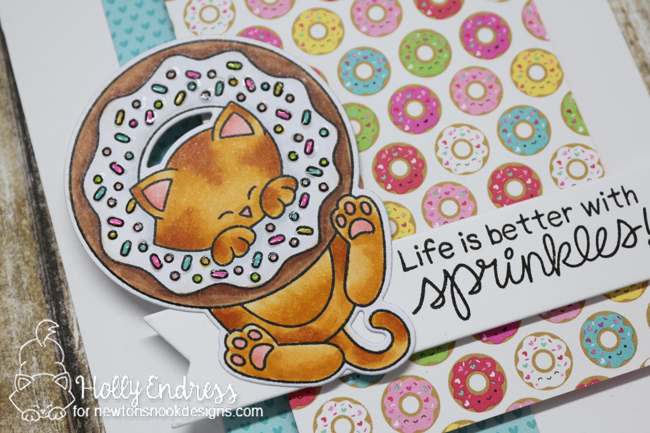 Can't get enough of that kitty and donut! So much cuteness. The box kitty is darling too, nice cards! I love these cards and these new stamp sets! The patterned paper used looks so good with the colored in stamps. So adorable! Cute card designs. I like the papers you used. Cats, Donuts and boxes! Awesome cards! Adorable cards! I especially like the box card because I love plaid and we just moved! (and will be moving again soon when we find a house). Thanks so much for the beautiful inspiration! A+ combo of Newton and Doodlebug. They look like they were meant for each other. 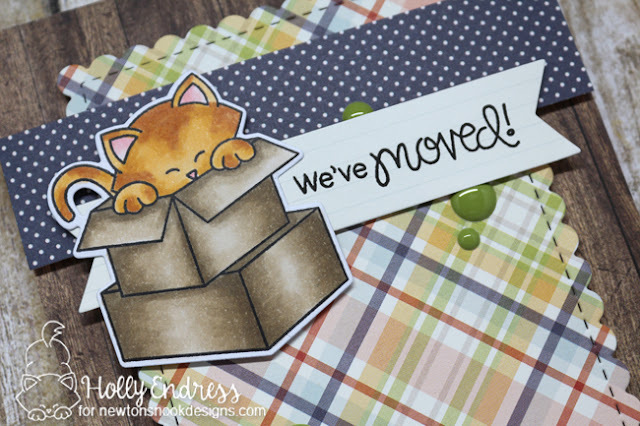 And I love the color palette on the "we moved" card; it's very cabin-in-the-woods-y. And also, Newton in a box. I will never be over this. Thanks for sharing these lovely cards! I love Newton's boxes - our kitties all love boxes. My hubby likes Newton's Donuts better since he loves donuts .. almost as much as the kids love boxes! Love your papers you used with these great images. Adorable cards. Love all the different patterned papers you used. These cards are so awesome! I love the fun patterns you paired with both images and the coloring is fantastic! So cute! love the wood background! Cute cards! Thanks for sharing. Your cards are beautiful ! Your coloring is incredible !